One doesn&apos;t necessarily think racing, or anything at all fast, when waiting for a plate at Roscoe&apos;s Chicken &apos;N Waffles. But the Southern Cali food chain is banking on just the opposite, when a leg of World Class American Le Mans roars near its Long Beach location. Now the official primary sponsor of the No. 77 Magnus Racing Porsche GT3 Cup, Roscoe&apos;s is hoping the car&apos;s eye-catching graphics will also grab the attention of many a spectator stomach, as it sits just blocks away, ready to serve. Contrary to what many may think on initial glance, the Magnus Porsche will run on gasoline, not fryer grease—though that seems like a golden opportunity somebody&apos;s missing out on. Check out the full press release below. April 11, 2011 (Salt Lake City, Utah) – In another major announcement for Magnus Racing, the team is proud to announce that it has formed a partnership with Los Angeles-based Roscoe’s House of Chicken ‘n Waffles for the upcoming American Le Mans Series at Long Beach, a featured event at the 37th Annual Toyota Grand Prix of Long Beach. A cultural landmark of Southern California, Roscoe’s House of Chicken ‘n Waffles brought soul food to Southern California in 1975 with the first 24-hour diner in Los Angeles. Its signature dish, Scoe’s Chicken prepared Southern Style with two waffles, has been popularized by the restaurant’s famous patrons - which include singers, to players of all Los Angeles sports teams, to countless television and movie stars. On any given night at Roscoe’s you might find Snoop Dogg or Larry King. Roscoe’s Long Beach location, one of five operated by the company, is located mere blocks from the Grand Prix Circuit at the intersection of Broadway Blvd and Alamitos St and is traditionally a hub of activity during the Grand Prix weekend. 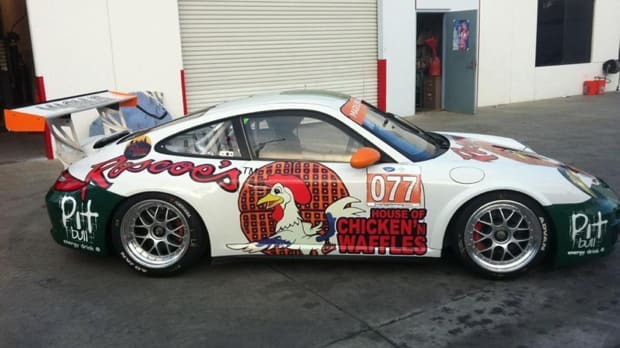 This year, however, will mark the first time that the distinctive chicken and waffle logo will appear on a race car. Driver Craig Stanton, who lives not far from the Roscoe’s Long Beach location, knows all about the legendary status Roscoe’s has in the Long Beach community. Additionally, the no.77 Magnus Racing Porsche GT3 Cup will feature additional sponsorship from partnering companies Pitbull Energy Drink and Seabird Jazz Lounge. Pitbull, owned by the Hip Hop Beverage Company, is the only minority-owned independent energy drink in the nation. Most popular for featuring no aftertaste and rated as one of the best tasting energy drinks on the market, Pitbull Energy Drink is available at Los Angeles and Orange County Chevron stations, Jethro’s Cash & Carry, and is coming soon to Walgreens. Seabird Jazz Lounge is another staple of Long Beach. Featuring a number of jazz and other musical acts, the club is rich with a diverse group of acts and a relaxed, easy-going atmosphere. The American Le Mans at Long Beach will be Magnus Racing’s second GT-C race of the season, and their last until the Baltimore Grand Prix in September. However, after being taken out of contention while leading the class in the eighth hour of the Mobil 1 12 Hours of Sebring, the team is eager to get the ‘Party Barge’ – the name bestowed on the team’s ALMS Porsche, in honor of the turn 10 crowd at Sebring – into victory circle. The American Le Mans at Long Beach weekend begins with Friday morning practice, 7:15 AM – 9:15 AM PST before qualifying in the afternoon, with GT-C qualifying scheduled for 5:20 PM – 5:35 PM PST. The Tequila Patron American Le Mans Series at Long Beach will begin on Saturday at 4:30 PM PST with the checkered flag falling at 6:30 PM PST. The race can be viewed live in its entirety on ESPN3.com, with coverage beginning at 4:15 PST, with a broadcast on ESPN2 on Sunday, April 17, at 5:00 ET. Fans of Magnus Racing can follow the team throughout the weekend on Facebook (facebook.com/magnusracing) and twitter (@magnusracing).